Flight of the Conchords are a comedy duo. Along with HBO, they made a TV series called Flight of the Conchords that followed fictionalized versions of themselves, as the New Zealand find themselves in New York City. 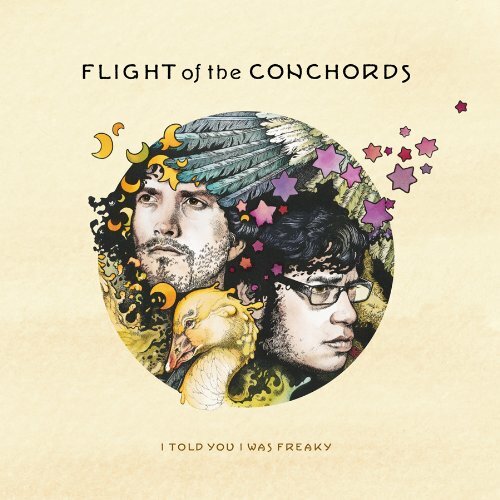 Jemaine Clement and Bret McKenzie form Flight of the Conchords. The second and final season of the TV season wasn’t quite as strong as the first. The songs in the show might have been weaker, but there were always some gems to be found throughout. I Told I Was Freaky is the soundtrack for season two of the TV series. The duo parody the style of many artists including Black Eyed Peas, Billy Joel, David Bowie, R. Kelly, and many more. Much of the album doesn’t work too well outside of the context of the television series. The songs are folded into the narrative of the episodes, making them inaccessible to a virgin audience. The title track is a song where McKenzie explains a fantasy sexual escapade. Without the context of the episode, this song has no real narrative structure, and not much humour. The humour is in McKenzie’s sexual inexperience and reluctance, but that’s not in the song which is just a list of silly, unattractive sexual ideas. With him wanting to impress a more experienced woman in the TV show, it makes more sense. While some of the songs don’t have much narrative function in the show, and thus work extremely well. The Billy Joel parody “Rambling Through the Avenues of Time” is a great example of how everything is laid out within the song. You have McKenzie telling the story of meeting his new love. At the same time you have Clement interjecting, McKenzie of course ignores his friend’s snide remarks. The album opens with “Hurt Feelings,” the tale of a sad rapper. It’s a great song about the sad lives of these rappers, their mothers forget their birthdays, their friends go into town without them, nobody compliments the meal. Hurt feelings all over. Ouch. “You Don’t Have To Be a Prostitute” is featured in one of the best episodes. They’re broke and living in the U.S. illegally. Jermaine purchases a new mug, which leads to the duo to be broke. Jermaine decides that the only option left for him is prostitution. This song is Bret trying to convince Jermaine to pursue another career. I never want to hear “Demon Woman” again, but I think it’s more a comment on the style they’re parodying than the song itself. “Angels” closed the first episode of the second season. It had me scratching my head. I was watching this song and wondering how the show jumped the shark so quickly. It picked back up, but a song about angels doing it in the clouds is not all that entertaining.